White paper on crime 2001 Part 2/Chap.3/Sec.3/2. Table II-8 shows the number of defendants sentenced to imprisonment with labor for life in the first instance over the last ten years to 2000, by type of offense. 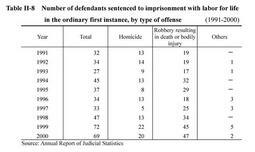 By type of offense, the percentage of the defendants sentenced to imprisonment with labor for life in all defendants found guilty was 3.3% for homicide and 7.6% for robbery resulting in death or bodily injury in 1999 while it was 2.8% for homicide and 6.1% for robbery resulting in death or bodily injury in 2000.